October 6th, 2010 by KTU | Filed under 6. Interior Materials and Finishes, Park City Mountain Modern. 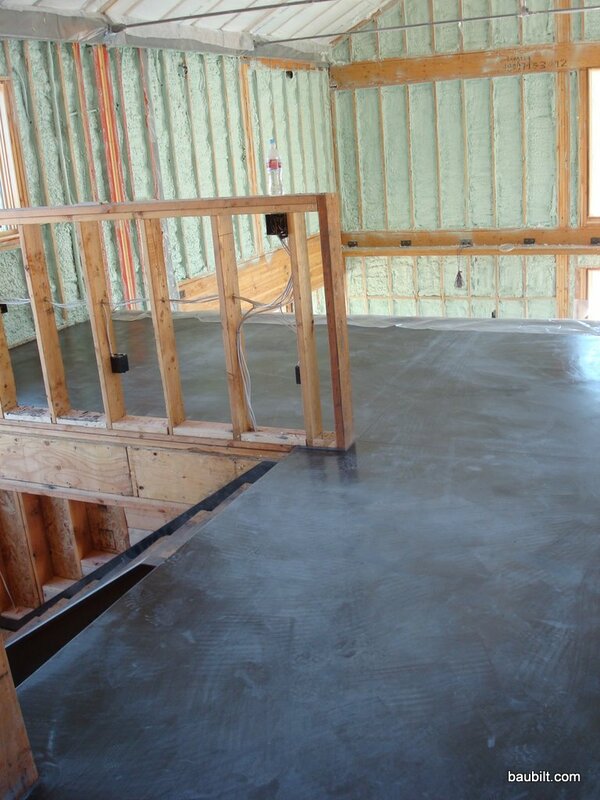 DuWayne (Gough Concrete Specialities) poured the upper-level concrete floors last week. 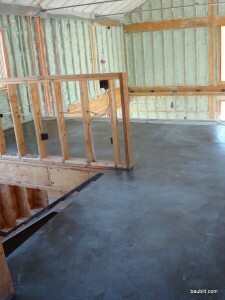 We specified a 3 inch slab of tinted concrete (the same 2% tint we used on the lower-level slab). A 24-inch grid of #2 re-bar is laid over the hydronic heating tubes before the floors are poured. I had them saw cut control joints in nice locations as I had on the lower level. Looks very nice, even if the floors still need some work with a Swiffer. 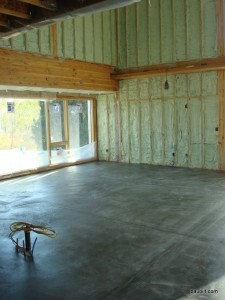 Main level concrete floors with saw cuts. Great resource! We are planning a house in N Georgia with polished concrete floors, hydronic heating, and oxidized steel siding. You experimented with carbon black pigment but wound up using liquid tint. Why did you change? Generally your flatwork contractor will have a preferred supplier of concrete. That supplier probably also has a standard approach to tinting the mud. Our supplier (Geneva Rock) is excellent and so I went with the tinting method they use, which happens to be liquid. I was doing all three levels of the house, but in two waves, with the lower level (basement) slab poured first. So, I took a good guess at the darkness I wanted based on the color chart and we used it on the lower level. My thinking was that if I wanted to adjust it lighter or darker on the upper levels I could. It turns out I was happy with the tint, so we kept it the same on the upper levels. It’s 11-7/8 Trus Joist on 16″ centers. The concrete is 3″ thick, so requires more than 2×10.